Of late, I have been getting on with one of the more boring layout building jobs; that of adding cosmetic rail chairs. 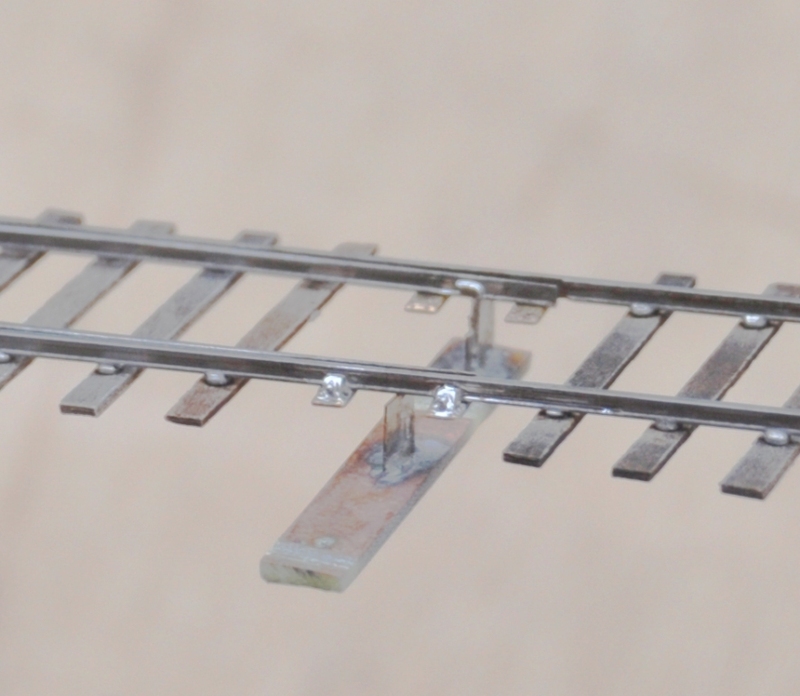 As I wish to retain the flexibility of soldered track construction (basically because I do not trust myself to get it right the first time! ), it is necessary to affix cosmetic chairs at each sleeper. I did lesson the task by using part soldered/part chaired plain track but even so I reckon there are three thousand chairs to affix……….. 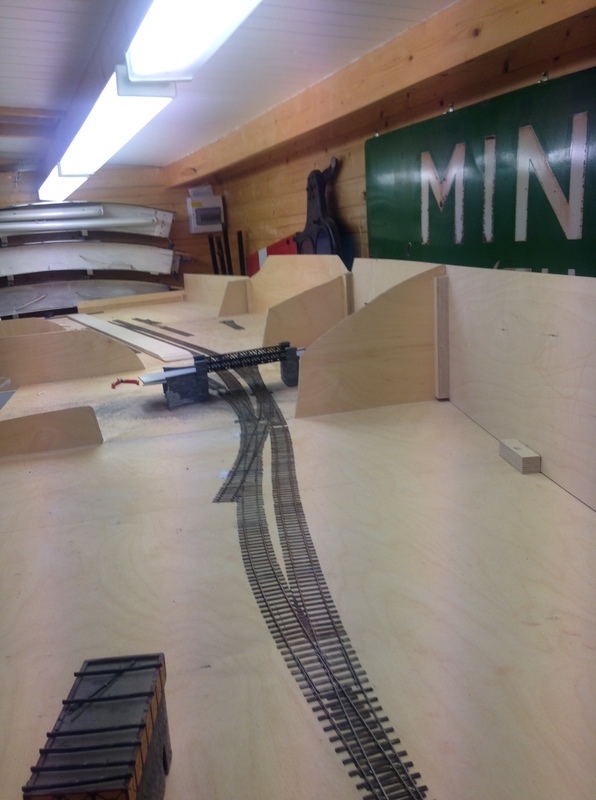 It does, however, make a big difference and the track is now beginning to look real – as you can see below. I am over half way and so it will soon – which is just as well as filing the chairs ready to lay is wearing my thumbs and fingers out to very sore digits! Arguably though, chair fixing is a form of procrastination because i must finish the wiring and then confront that turntable again! …………again because I cannot put the words I would like to use on a public blog! This was the scene that confronted me over the weekend when I was trying to fettle the layout for operation – a good number of broken chairs and detached solder joints. All this resulting in some fairly severe gauge narrowing! It has been fairly warm here in blighty (I know that is a relative concept to some of the readers of this blog in the more far flung corners of the world – the Brits like to moan about our weather!). This has resulted in some thermal expansion and clearly I have not allowed enough joints to absorb this. It will be simple enough to fix, but altogether a pain. Perhaps more irritatingly (because it has happened rather more), it has closed the gap on a number of crossings. This has resulted in a fair few short circuits and a campaign of dealing with these has taken a good chunk of my Sunday up! 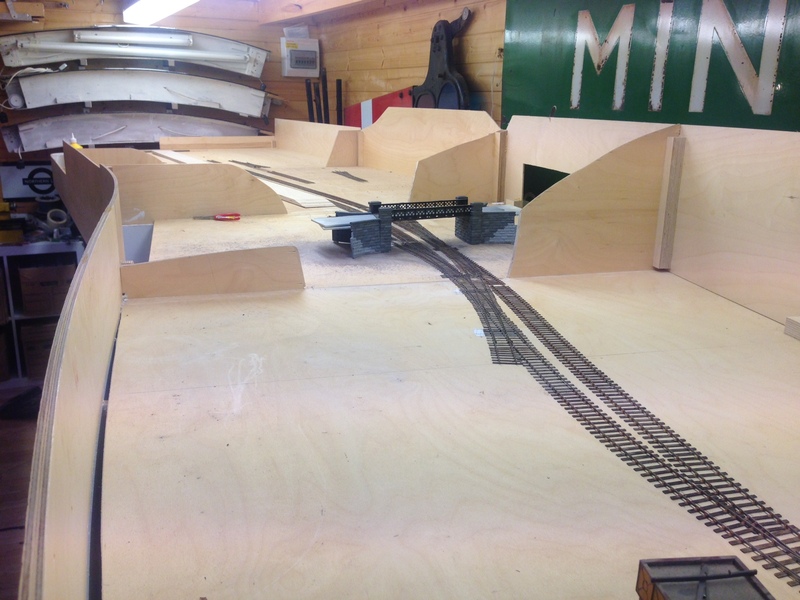 Matters have been progressing with the layout on and off through the summer and a lot more of the track has now been laid. We have both the main line and the full run around loop complete, along with most of the bay and its run around loop too. The line diverging in the foreground is going into the shed area, those visible below the bridge go to the bay (left) and yard (right). A signalling trackplan can be found here. I quite like the sinuousness of the line, which can be seen here/ I have done this in order to give interest to the layoput but it is pretty typical (indeed characteristic) of the lines to the west coast as they wind through the mountainside. I do have in mind some hills to justify this in the finished item. Already there is a sense of magnitude to the station forming, the platform face (which is not all in view in either of these views, comes in at about 7 feet – enough for an eight coach train of pre-grouping coaching stock. Really, its length is defined by the length of the bay – this will become clearer when the train shed appears because the bay has to start clear of this.. 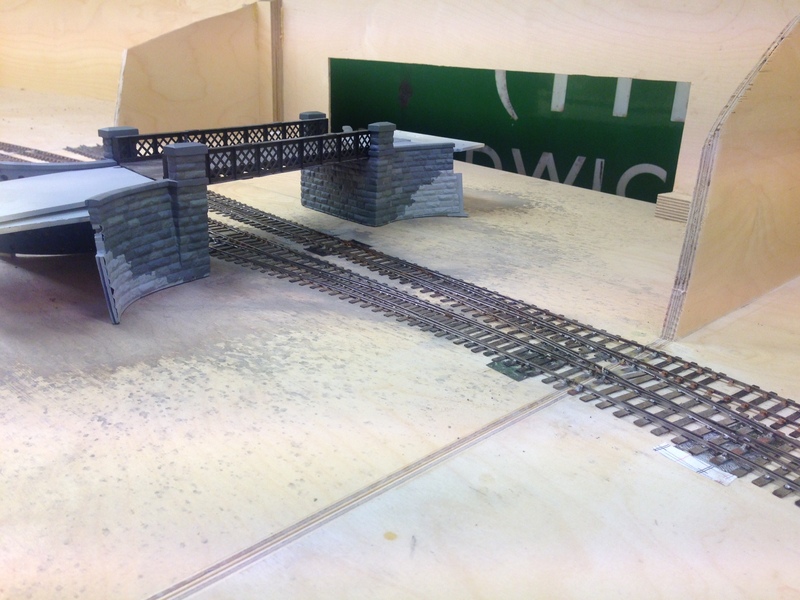 I have also placed into its approximate position the road overbridge that separates the shed from the main station area. The construction of this can be seen in postings here and here. The intention of hte bridge is to act as a scene blocker and thus to compel the watcher to view the layout from more than one location to appreciate it. Definite progress was made with Glenmutchkin over the last 10 days, in that the first portions of trackwork have been laid. At last, it is an embryonic layout! This was started at the two platform faces as in practise this is one of the major setting out points. 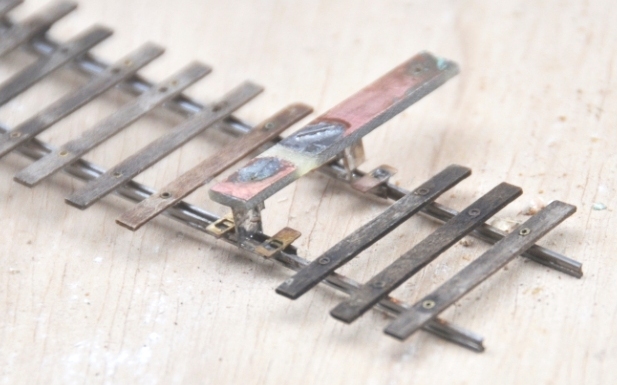 This is because it is about the only straight bit of track on the layout and also because the platform needs to sit on top of the most substantial baseboard joint on the boards – where the front and back boards abut. The platform will be a separate element of construction and will bolt over the joint, hence hiding it from view. The scrap tak is seen here sitting in the branch bay. 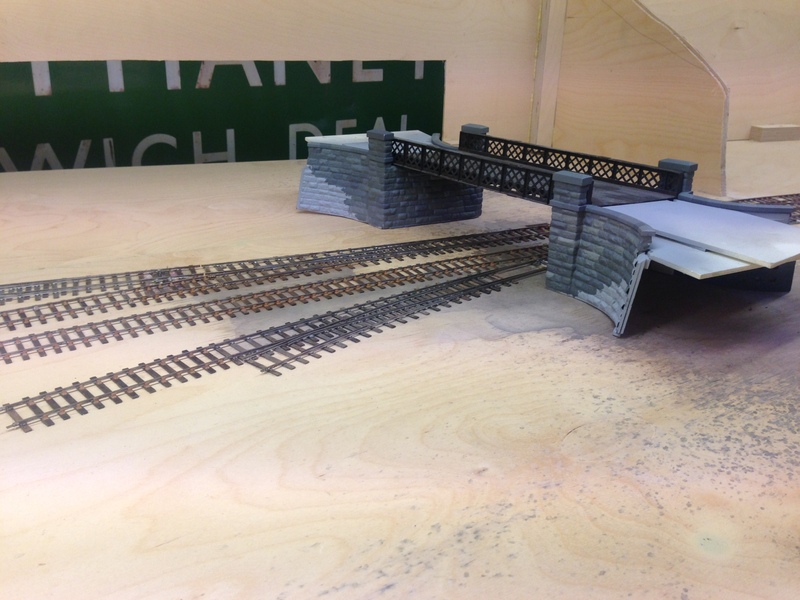 The branch bay platform face is to its full length, the main line platform face still needs to continue for 500mm – into the trainshed which presently can only be imagined! 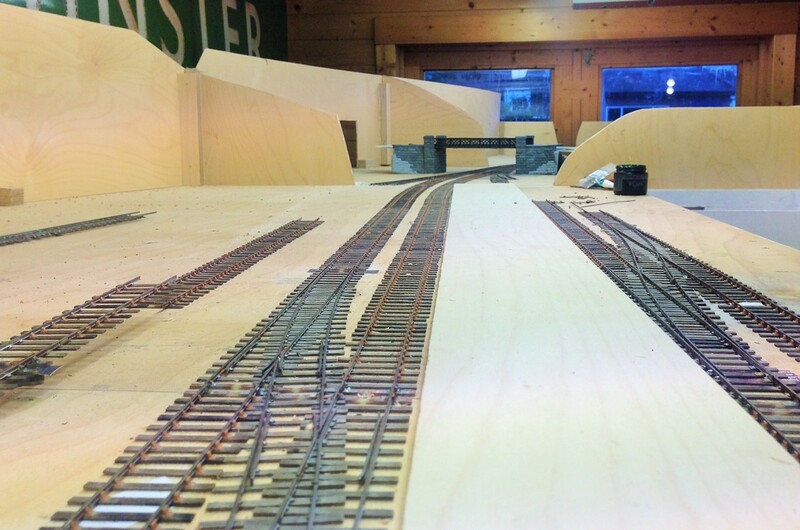 Now that the first few bits of track have been laid, a sense of scale starts to become apparent. Not for me the “model to the railway boundary only” approach – I am very definitely attempting to portray the railway in its setting. The other major setting out point for the layout is the link into the engine shed; which is a single slip from the main line and a cross-over from the main run-around loop. 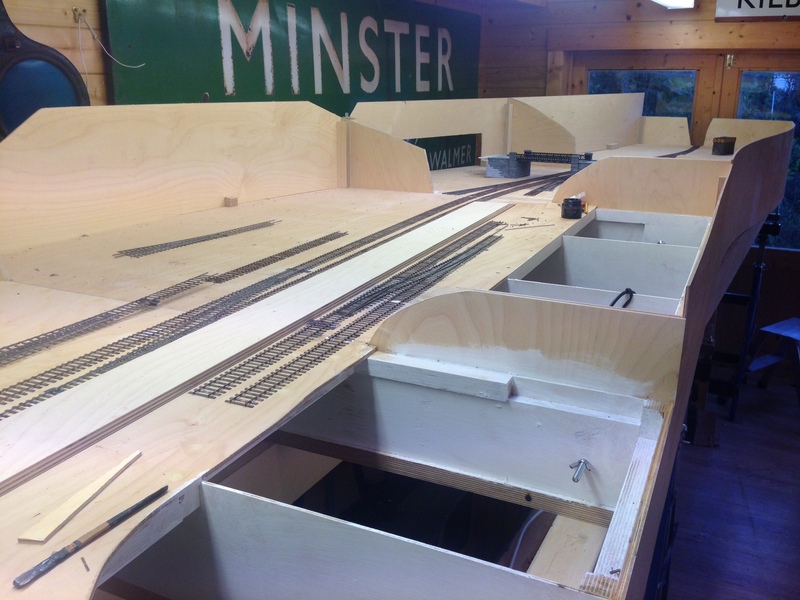 The baseboard joint is mid-way through the crossover, so deines this end of the layout. Whilst I have not put any posts up showing progress with the boards for Glenmutchkin, progress is being made and the last two boards are essentially now finished. I am hoping that with one more day’s work which will mostly be to build up a carrying box for the final two, they can all come home. 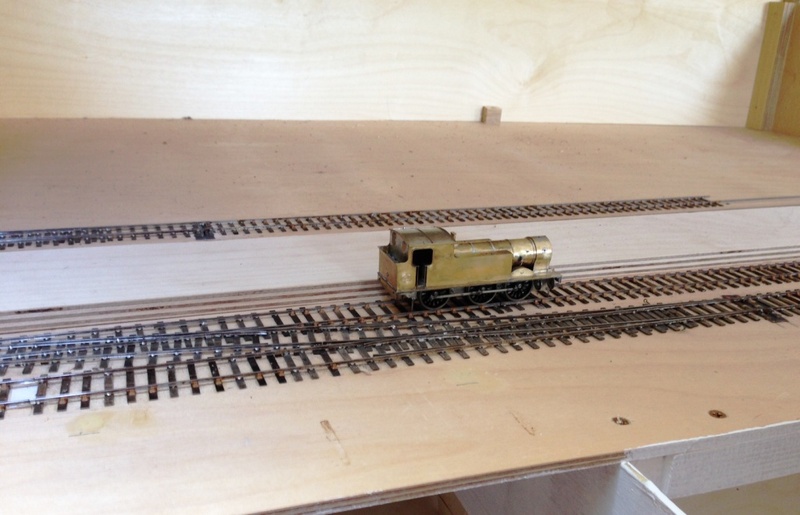 In anticipation of this, I have been building some turnouts and a bit of the basic trackwork. 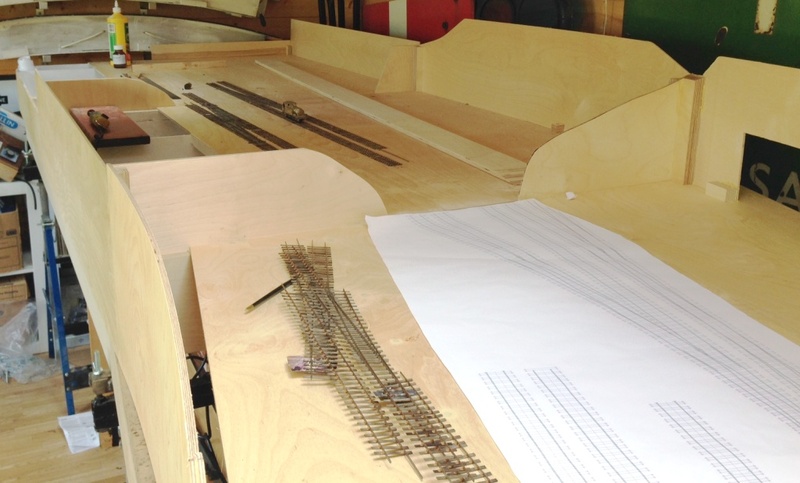 I am only able to do the turnouts which I am reasonably confident will not change shape when the track is finally laid out on the boards. In essence this means the crossings in the bay, the main line and the goods yard. I have also done one of the turnouts in the yard. So seven down, twelve to go including a slip! You will see that relatively little of the TOU is exposed (and when it is painted it blend away further). Equally it is much more durable than most of the other options out there because the switchblade is held by both a wire strip but also to some brass strip that is tight to the underside of both the switchrail and the switchblade. By installing this strip in this location, the switchblade is held in a vertical plane much better than other solutions. I think this leads to better running. This is what it looks like as it is being assembled. You will see that in essence is it is merely a bit of copper clad below the switchblades, but lowered somewhat further due to the use of the brass strip. This allows the whole lot to be hidden below the boards. You will note the rather unusual arrangement of sleepers. This is called interlacing and was very common on many pre-grouping lines, including the Highland. I will expand on this in a future posting. 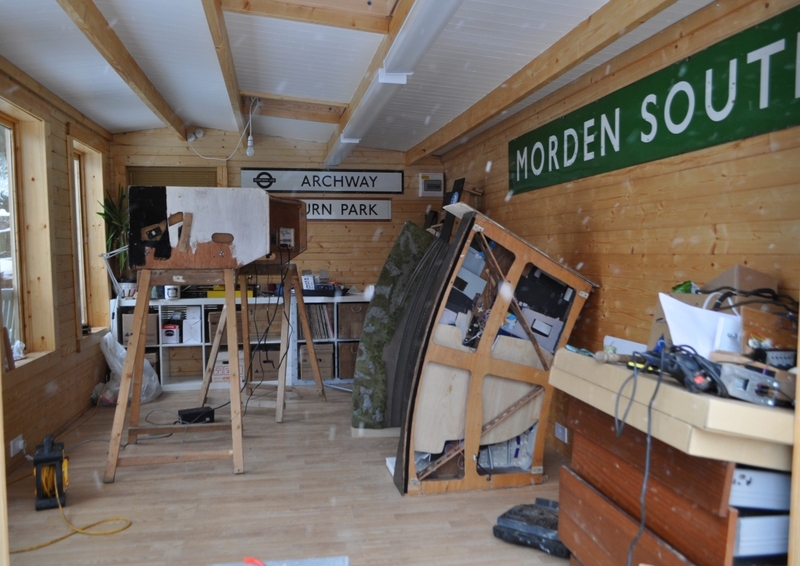 Glenmutchkin: Part 1 – Have summer house, will build……..
Much of 2012’s modelling time was devoted to the building or a summer house; at least that is what we told the planning authority it was. In reality, it was a better storage home for Portchullin that formerly had to be carted up two flights of stairs to the loft to live and also somewhere to get some of my “railway stuff” out of the house. 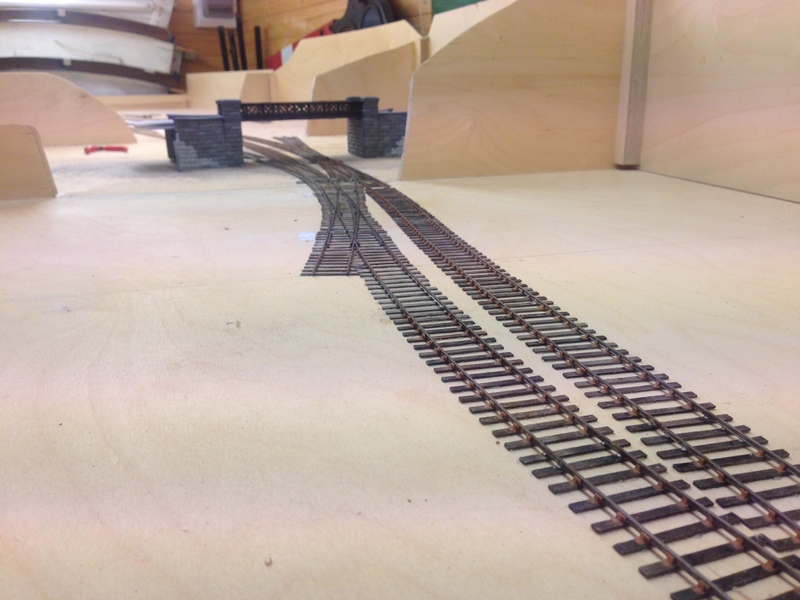 At least the domestic authorities knew that it would provoke me into scheming my next layout…….. There is a lot of working up still to do on this, but it shows the basic concept that I’ll be working too. I’ll explain more as to its concept another day, but it draws its inspiration from a couple of the Highland’s termini so hopefully you can see a little of some fairly well known stations in the plans.